If you no longer wish to run your WordPress site on the DreamPress platform, you can downgrade your WordPress site to a regular hosting plan such as Shared, VPS, or Dedicated hosting. The following instructions describe how to downgrade to a Shared hosting plan. If you wish to downgrade your DreamPress site to a VPS or Dedicated plan, then please contact support. Click the 'Change plan' link. On the bottom right, click the 'Migrate off DreamPress' link. In the pop-up that displays, select which server you'd like to migrate to. 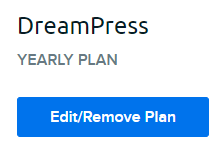 Click the Migrate off DreamPress button. You must have an active hosting plan in order to downgrade your DreamPress install. Do I need to remove any other files or plugins? 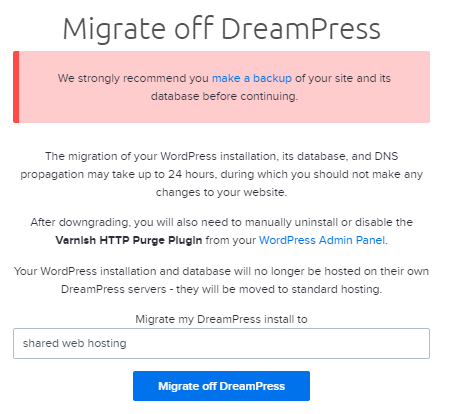 When you downgrade from DreamPress, any DreamPress specific code (such as Proxy Cache Purge and OPcache plugins) is removed from your WordPress site. Article last updated March 24, 2019 17:13 PST.